It turns out that everything we think people hate about us is wrong. Psychologists have a term for this: projection. We project our own feelings and expectations on other people and make predictions and decisions based on that. For big things, like whether the puma down the pathway would like to eat us, this usually works out for the best. It sort of fails for other things, like whether our significant other will be stupid and weird about that tattoo we got while drunk on Spring Break, or our habit of making a trumpet noise every time someone says “irrelevant”, or the fact that we’re a five-hundred-year-old fairy. The trick is to recognize when you’re doing it and stop it. I’ve found that most people are more than happy to tell me what they really think if I give them the chance. It actually works out a lot better than it does for me to tell them. 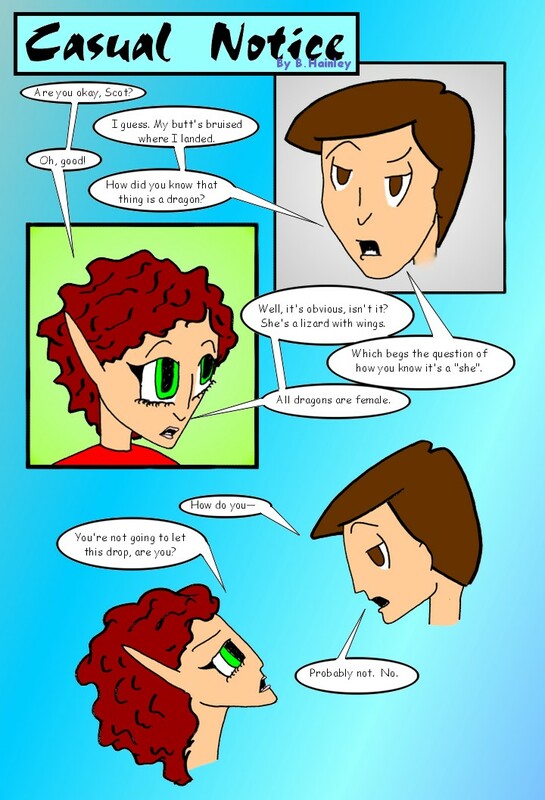 This entry was posted in Comic on December 27, 2013 by Casual Notice. So, since Christmas is coming up this Wednesday, I decided to jump a little ahead in the archive and pull out one of the Christmas comics. 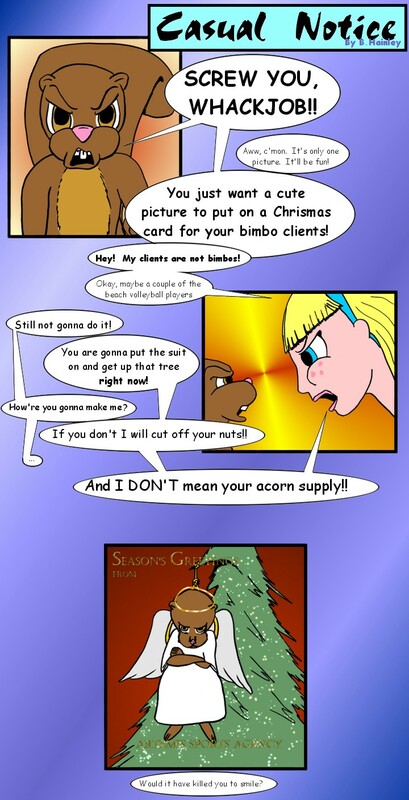 This was the first one, and the first of the Christmas Card strips featuring Diana and Phil the Squirrel. This entry was posted in Comic, Life on December 21, 2013 by Casual Notice. So, finally, after being manhandled by a dragon that has imprinted on him, Scot wakes up and realizes that not everything is as he wanted to convince himself it was. This for me, is the fun of fantasy. You can take a normal situation and point out the flaws of human perception by blowing it all out of proportion. Sure, Scot had all the evidence of weirdness right in front of him: the Ghost, the wings, the fact that her mother called him a monkey (off-panel…Petal Oak refers to all humans as monkeys), but it took a huge event he couldn’t deny or avoid to get him to stop rationalizing the truth. Yes, it’s ridiculous and silly to think someone would be that way. But how many people convince themselves that their abusive significant other is just “going through some stuff” and will magically stop punching them one day? How often do people find themselves buried under an avalanche of debt because they couldn’t look dispassionately at their finances and choose to make sacrifices? We all have a fairy in the house, but very few of us will be lucky enough to get a bearhug from a newborn dragon. This entry was posted in Comic, Life on December 13, 2013 by Casual Notice. So, it turns out that dragons can and will eat almost anything. Also, they’re easily distracted. This entry was posted in Uncategorized on December 6, 2013 by Casual Notice.